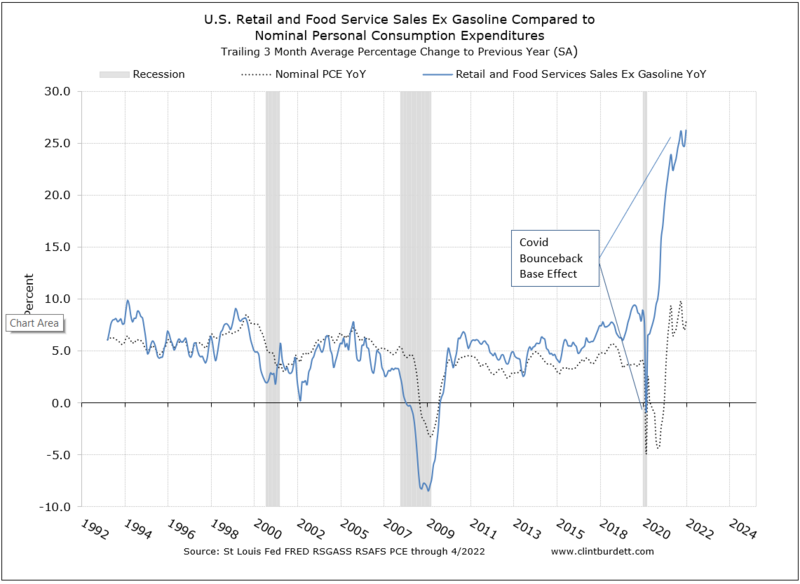 Superb l/t analysis of business cycle, link to chart, leading indicator for increased consumer spending. Updated infrequently. 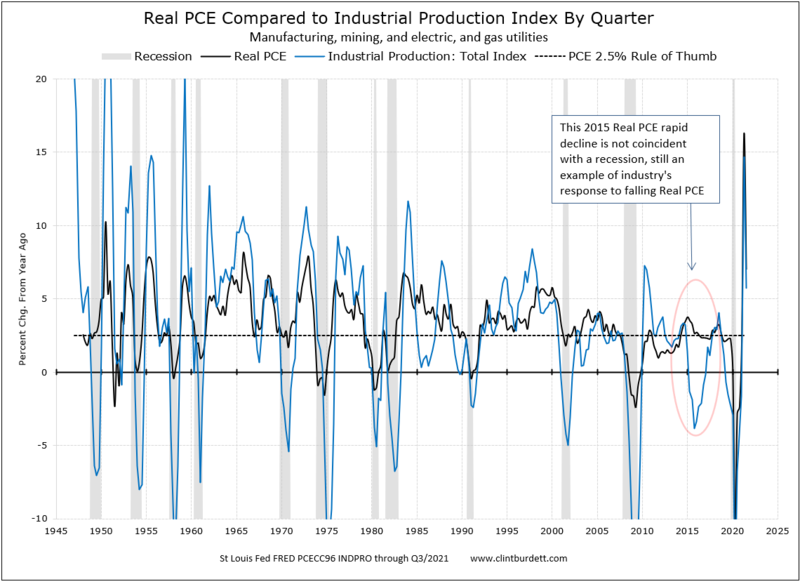 Here there is a remarkable consistency (correlation) between Real PCE and Total Industrial Production rate of growth peak and trough year on year. I am uncertain if PCE and Production are causative. 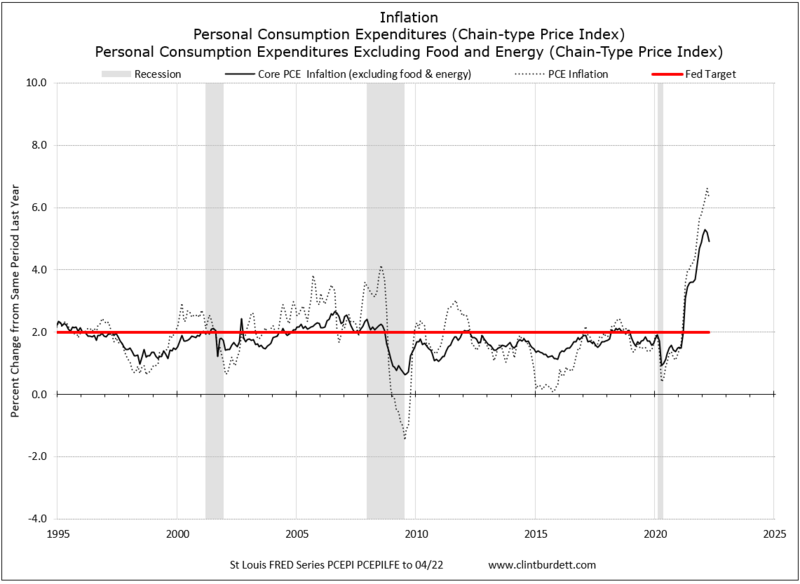 I suspect earnings, population and other factors change spending patterns. Not seasonally adjusted. More positive change indicates growing economy. 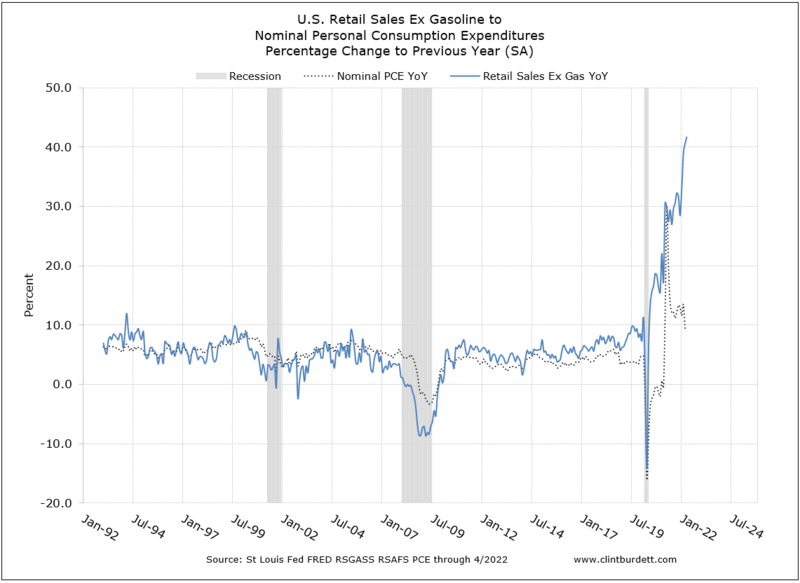 Compares Retail Sales ex Gasoline to PCE (consumer spending) YoY rate of growth/decline using trailing 3 months for smoothing. A rule of thumb is a change of direction over three months is significant. Average line for last 24 months used to determine growth rate comparisons trending up, down or flat. Without smoothing, the movement is more dramatic, which is often called noise. 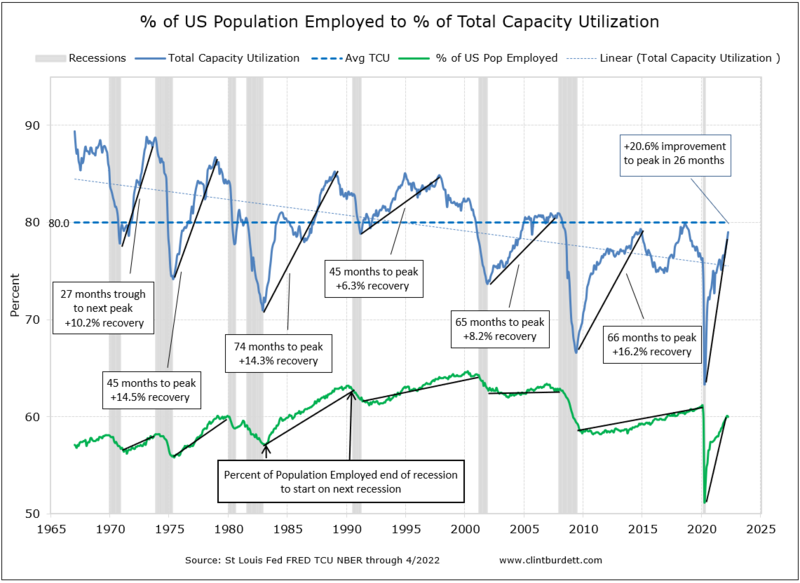 In the recoveries for the 2002 recession and the 2008 Great Recession, the percentage of US population stays flat. Hiring does not exceed normal population growth. 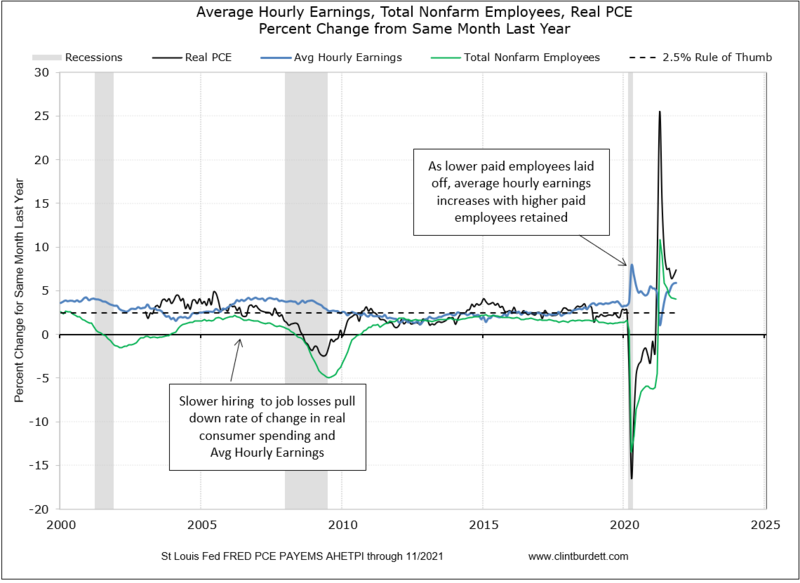 Total nonfarm employees times average hourly earnings equals total income. More hiring, flat wages, less income than more hiring, rising wages. Overnight cost of borrowing in USD. Moves up, credit tightening. Treasury-bill to Euro Dollar spread in bps. Spread widening, liquidity being withdrawn. Interest rate for bank unsecured loans. Moving up, credit tightening. Chicago Board Options Exchange Volatility Index, implied volatility in S&P 500 index options next 30 days. Moving up, options cost more, investors expect market to be more volatile. 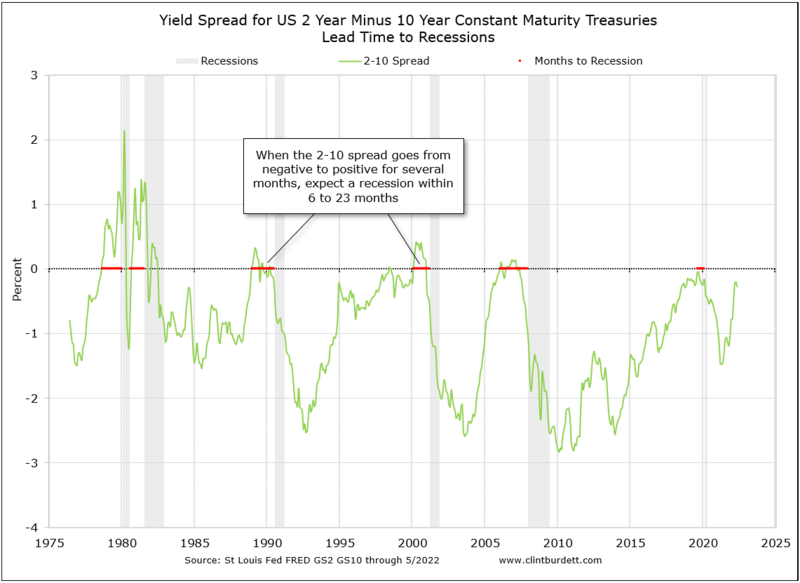 The spread between the rate to exchange floating currency fixed interest payments and Treasury yields for two years notes. A SWAP is a form of insurance, in the event the underlying securities will not make payments, the seller of the swap pays the interest and receives the underlying security. The spread is the relative "cost" of the insurance. At least two months time late. For new construction reported upon a deposit at any stage of construction. Contract signed to buy previously owned home, waiting on escrow about 2 months out. Similar to New Home Sales after deposit. 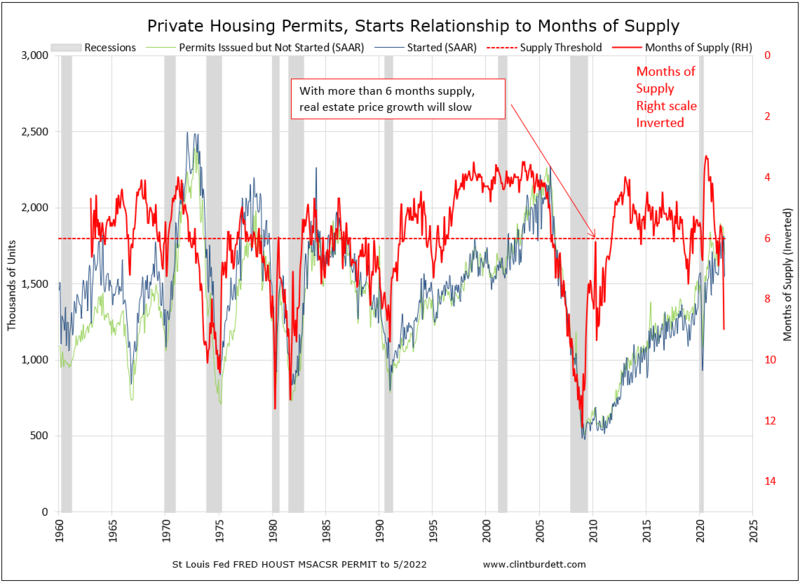 Months of supply of existing homes. Normal is about 7 months or less.